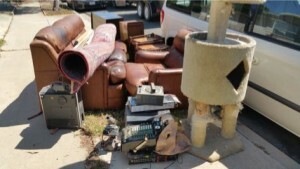 We we called out to Point Loma by a customer helping her elderly parents get rid of junk and clutter. Our customer was happy that we had up front fees so that she could be confident her parents would stay within their budget for this clean up project. Our customer cleaned out the garage and was getting rid of old furniture, bikes and just plain junk. He placed the junk in the driveway and we called him once we arrived and quoted a fee for removal. He went online to pay and we texted him some pictures of the completed work. 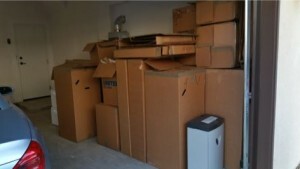 We first quoted $125 to haul away this moving trash but lowered the fee to $99 because we were able to condense the load by breaking down many of the boxes. Our customer in Sorrento Valley was happy to save $25 and appreciated our efforts to save them money. 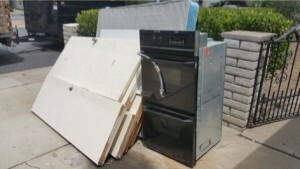 Several box springs, some solid core doors and a double oven. All of these items are bulky and heavy. 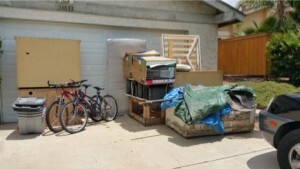 We picked up this load of junk for our customer in UTC and he was happy enough to write a A+ review on Angie’s List. THANKS!